We create our landscape designs using the steps below, taking into account your needs and desires along with our landscape designers experience. Initially, we will meet with you at your home to determine the scope of services. At the meeting, we will discuss the design style and components you envision and your overall budget. The initial meeting also will provide you an opportunity to see some examples of our work and address any questions you may have. To schedule an initial design consultation, complete the online Contact Form, and we will contact you by phone to discuss your project. To prepare for the meeting, complete and submit through our website the Project Design Questionnaire. This is the your “wish list” of the elements that you would like to see included in your project. Choose all the outdoor features you would like to accomplish your goal; pool house with outdoor kitchen, fireplace and dining area, free-form swimming pool with waterfalls, an in-ground spa, screened porch, multi-level deck, a sunroom, patio, pergola, fire pit to enjoy during your evening swim, are all examples of project components. At the meeting, have available, a copy of your House Plat (property plans) showing the property boundary and house footprint, this is what defines the basis for design development. Optionally, you may want to visit the HOUZZ website and create an Ideabook of examples of the design elements you would like to incorporate in your design project. A Design Agreement will be presented, and once we are engaged as your landscape architects, we will develop an onsite analysis to verify existing site conditions shown on the property plans (house plat) provided by the client. We will record field measurements, spot elevations and photograph the site. Next, we will prepare two conceptual plans for your review. Our clients are active participants in the design and want your input and comments. Once you have settled on the design, we will develop the Preliminary Master Plan which will allow us to provide you rough estimates for the construction based on the design features in your drawings. The final design development phase is where the design takes its final shape, we take your feedback and refine the drawings to fit within your budget or phase the project and prepare the Master Plan with greater detail. Once you have approved the Master Plan and construction budget, we can provide you a proposal to prepare your Construction Drawings and specifications. The Construction Drawings such as; the Layout Plan, Grading and Drainage Plans, Lighting Plan, Footing and Framing Plan, Material choices and Hardscape Elements are completed to provide contractors a detailed guide to bid on and construct your project. The drawings are also necessary to obtain an approved building permit. When the construction details are completed, we can act as your liaison and help you bid the construction among qualified contractors. We have experience with both the design and construction of hardscapes and landscapes and can be involved in the process from design to installation. We will make site visits during construction to ensure the plans are carried out as approved, and make any necessary adjustment to the design. At the completion of your project, we will conduct a final walk-through with you and record a “punch list” of items to be completed. We are interested in achieving a successful project and will guide and assist you to execute your vision. We also offer as an additional service, 3D Computer Generated Perspectives and 3D Virtual Reality Videos of your proposed project that give you visual support with 360 degrees viewing capability. This 3D design allows you to do a virtual tour of your future outdoor living space before it is built. The conceptual imaging or perspectives are very useful in visually communicating a design’s intent. Examples of our videos can be found by going to the YouTube icon on the heading bar or clicking here. We can also prepare for you a Landscape Planting Plan which is an essential part of an attractive landscape design. 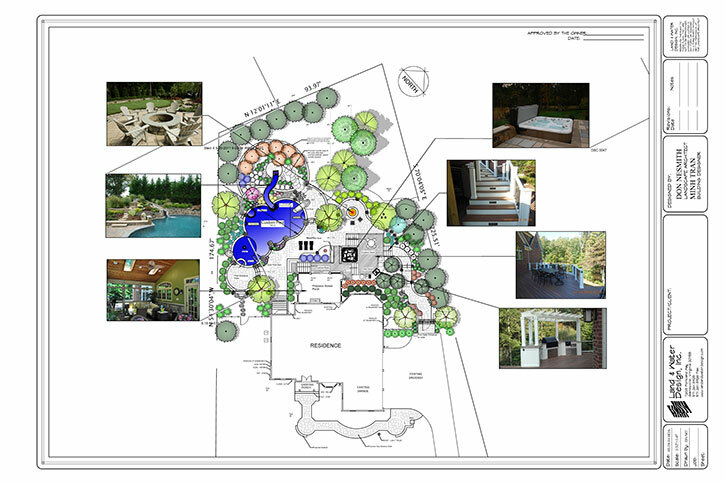 The planting plans depict detailed information with the location of all proposed trees, shrubs and plant material within your outdoor space as well as characteristics including size and quantity.